One of my favorite spots in San Diego County is the secret sea caves located at Cabrillo National Monument. In my opinion, the "trail" to the caves in Cabrillo National Monument is also the best "trail" in the monument as well. At this point, astute readers are probably wondering: “Why is ‘trail’ placed in quotations?” The reason I placed it in quotations is that the best trail in Cabrillo National Monument isn’t a trail; it's more of an adventure. And, in terms of full disclosure, this trail isn’t for everyone. For starters, it involves a little navigation, a little timing as it is only fully accessible at low tide, and a little swashbuckling. But, if your timing is right, and you are willing to take some small risks, the payoff is fantastic. The Cold War- a great time to listen to the dulcet tones of The Ink Spots singing I Don’t Want to Set the World on Fire while wondering which superpower would ultimately prevail. Today, even though the United States won the Cold War, not much has changed: during the Cold War, there was paranoia over potential nuclear attacks. Today, there is paranoia over potential terrorist attacks (with or without nuclear weapons). During the Cold War, there was biting, heated political rhetoric about democracy versus communism. Today, we have…biting, heated political rhetoric about democracy versus communism or socialism. The phrase, “the more things change, the more they stay the same” seems fairly applicable regarding these situations, but one thing that has changed, and for the better is the decommissioning of numerous ballistic missile facilities due to the Strategic Arms Limitation Talks (“SALT”) and Strategic Arms Reduction Treaties (“START”) that occurred at the end of the Cold War. Today, the only remaining Titan II intercontinental ballistic missile site (“ICBM”) that remains open to the public – or slightly operational at all is the Titan Missile Museum in Sahuarita, Arizona. Since I’m a sucker for strange spots, I decided to swing by and check it out when I was in Arizona a couple of weeks ago. The first thing you realize about the missile site and silo is that during the Cold War, the government of the United States was very smart. How so? Think about it: the silo, the missile, and the site were and are located in the middle of nowhere in an inhospitable desert. If there had been nuclear war, the area would have been reduced to a location that was in the middle of nowhere in a now inhospitable and radioactive desert. In short, no loss to the United States whatsoever. Take that commies! (People of Sahuarita, I kid – no hate mail, please, I love being out in the middle of inhospitable nowheres). The second thing you realize about the site is that the Titan missile in it protected the United States not just from the Soviet Union, but from the Borg as well. That’s right: the Titan missile protected us in the past and will protect us in the future as well, if Star Trek: First Contact is to be believed. Again I say, kudos to you government planners! What’s that? Start Trek isn’t real? Pshaw, that’s not what I hear! In any case, Star Trek: First Contact was filmed at the silo (in part) – so it must be true! But onto my review of the actual museum and tour, as opposed to my observations of things I learned even before I entered the site (such as to also watch out for rattlesnakes. I know! They hang out in the desert! Who knew!). The tour: well, the museum and tours are run by volunteers of the Pima Air and Space museum, and all joking aside, they are very knowledgeable about the site, the history, and the region. I was impressed by all of the knowledge all of the staff members brought to the facility and the tour; however, at times, I felt that there was a little too much information being imparted, such as the exact composition of Titan II rocket fuel, and how it was transported from three different sites to Sahuarita. I like technical information as much as the next guy, but at times, there was definitely some information overload. I have to admit that as a Cold War espionage aficionado, I found the information about how the crew entered the silo and base through a number of secured locations in a certain amount of time fascinating. There were some odd moments on the tour, however, starting with the requirement that every man over 5’10 wear a safety helmet. What about women over 5’10? That question was never answered for me – and was probably information that was kept on a need to know basis. Secondly, this was another site where photography was supposedly not permitted. Seriously, Arizona, what’s up with that? This time, I was told it was for “national security reasons”. Now look: I’m as patriotic and respectful of National Security as anyone, but you’re honestly going to tell me I can’t take pictures of an over thirty year old facility that’s been decommissioned, open to the public, and full of thirty year old technology because of “National Security”? That boggles my mind. As you can see, I took two pictures – one of the interior corridor, and one of the blast door. If the release of these images means that the commies will win the Cold War that’s already over, I’m sorry America. The coolest thing of the tour – despite being inside a nuclear ICBM silo – was the simulated launch at the end of the missile. If I had gotten to touch the missile, that would have been the best part of the tour easily. Having said that, despite receiving a little too much information at times on the tour, it was definitely a good experience that I’d recommend. Directions: The silo is located at: 1580 W. Duval Mine Rd., Sahuarita, Arizona, which is approximately two miles west of the Interstate 19. Tips: Apparently, there are tours of the silo that allow you to visit the crew quarters, and at times, stay inside the silo. While those options sound pretty darn neat-o to me, I sadly was not there at the right time to experience those options. Personally, I think the tour is best suited for anyone who was born after 1991, as it will blow their minds as to the state of technology back in “the dark ages” of the Cold War. You might not know it from reading Coleridge’s stanzas, but Xanadu is actually in Southern Arizona. To be precise, the entrance to Xanadu is found in Benson, Arizona. Don’t believe me? It’s true. That’s where the Kartchner Caverns are found, caves that were originally named “Xanadu” by Gary Tenen and Randy Tufts to protect them and keep them secret from the general public. Alright, fine – if you want to be technical, Coleridge was talking about an imaginary land, one that only existed in his mind and one that was probably fostered by a wicked opium addiction, but he might as well have been talking about the Kartchner Caverns, because they are that phantasmagorical. Enough about Coleridge – let’s talk caves. The Kartchner Caverns are over 50,000 years old, and are some of the most well preserved limestone caves in the world. These caves are a part of the Arizona State Park system, and have an interesting human history from the late twentieth century on. As I mentioned above, the caves were discovered by Gary Tenen and Randy Tufts, and they were so concerned that the caves would be co-discovered or found by other parties and either ruined or despoiled, they only referred to the caves with code words. Eventually, they introduced the caves to various parties, and eventually the caves were acquired by the State Park system to be protected in perpetuity for the general public. (A more extensive history of all the secret shenanigans of Gary and Randy can be found here: http://www.explorethecaverns.com/caverns-history.html). I recently visited the Caverns, and took the Rotunda/Throne Room tour. As the park website suggested, I booked my cave tour tickets early, and arrived early. Even though the parking lot was beginning to fill up on a sunny Sunday, the park rangers helpfully moved me to an earlier tour that had availability with no charge. The Ranger leading the earlier tour noted that my group was somewhat lucky, as it only had 13 people in it, as opposed to the usual thirty (30!). The first unique thing I noticed about the Caverns, after the informative museum and shuttle ride to the cave entrance were the massive airlock doors that you must pass through to enter the caverns. That’s right; I said doors – plural, as there are three. The state of Arizona spent over 28 million dollars to protect the caves – and their warm, moist environment from the dry environment of the desert. From what I could feel, the doors are doing a great job. The ambient temperature in the cave was roughly ten to fifteen degrees warmer than outside (it was a cold morning), and it was downright muggy. As for the remainder of the tour, I’ll be honest: I’d prefer to explore this location or any location on my own. Now that I’ve complained, I’ll be the first to admit that the Ranger leading the hike was well versed in the different formations of the Throne Room and the Rotunda, and very knowledgeable about the history of the caverns, and the scientific processes that formed them. The tour ended with a light and music show at the infamous “Kubla Kahn” pillar – which is the largest limestone column in Arizona, which was also pretty cool. Tips: Astute readers and even first time visitors will notice that I have posted no pictures of the caverns and are probably wondering why there are no photos in this entry. Alas, the caverns do not allow photography at all. However, there are some great videos of the formations at these links, which give you an idea of what you can see: http://youtu.be/ISewwO38xs0, http://azstateparks.com/parks/kaca/index.html. It’s also important to note that portions of the caverns are closed during the year to protect the native bat population. Finally, if you’re one for conspiracy theories and or good fiction, read this link to learn how the caverns may be inhabited by a monster, and why that is the real reason why photography isn’t allowed: http://sylvestrusmaximus.tumblr.com/post/15805539951/the-creature-of-kartchner-caverns-preview. Tuzigoot. That’s right. I said it – Tuzigoot. It’s not a curse, it doesn’t mean anything about aliens, it’s a word from a long lost past. Tuzigoot is the Apache word for “crooked water”. But, if you’re considering going to Tuzigoot, there’s something even more interesting than long-lost words – it’s the fact that the entirety of the ruin was partially hidden when it was excavated in the 1930’s. As I mentioned last week, Tuzigoot is the ruins of a small city, and now is the second National Monument located in the Verde Valley (the first being Montezuma’s Castle). Like Montezuma’s Castle, Tuzigoot was inhabited by the Sinagua people in the 1000’s. Again, like Montezuma’s Castle, the site was mysteriously abandoned in the 1400’s by those same Sinagua people. Unlike Montezuma’s Castle, however, Tuzigoot was constructed atop a reasonably sized hill with commanding views of the Verde Valley. To me, this is where things get interesting – whereas Montezuma’s Castle was (and is) hidden away from inquisitive eyes for hundreds of years in niches in a slot canyon, the ruins of Tuzigoot were in plain view for hundreds of years. That’s right: the ruins of Tuzigoot were in plain view for hundreds of years – and yet hidden. Now, I know there’s bound to be skeptical readers that are reading this blog and saying, “Yeah right – I know that someone had to have seen those ruins”. 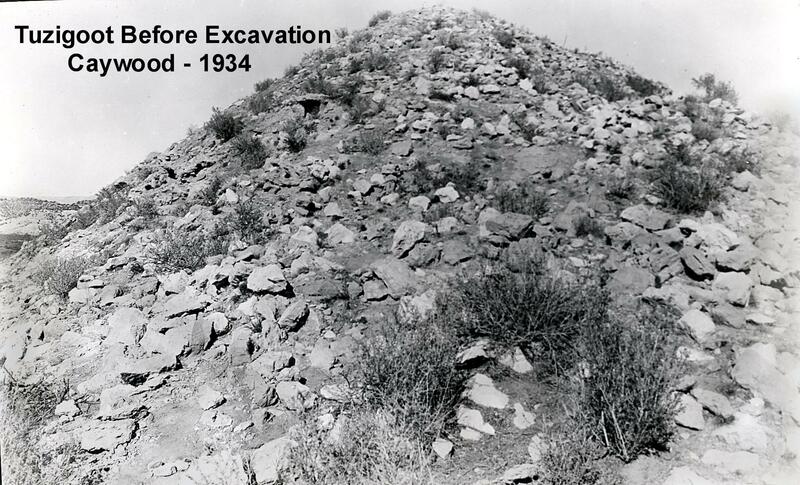 Riddle me this though, readers: would you have known that ancient ruins lurked here in 1934 had you been walking through the Verde Valley and examining the hill that Tuzigoot stands on at a distance? Would you have? Would you have known that based on seeing something that looked exactly like this: http://www.nps.gov/tuzi/images/20090728174213.jpg ? Personally, I rather doubt it. And, this goes to my larger point that I talked about a week ago: use your powers of observation – there’s always something magical and mysterious waiting to be discovered out in the world. (http://lastadventurer.com/last-adventurers-fieldnotes/2012/5/1/chapel-of-the-holy-dove-kendrick-park-arizona.html) The archeologists and people that worked on the Tuzigoot excavation certainly thought that there were many interesting things to be discovered too! Tips: As Tuzigoot was a small city for a number of years, it also contained the remains of a number of individuals that died during that period of time. According to the National Park Service, the Sinagua people buried the remains of dead children under their living space, in order that they could be with their family. As such, when you are walking around the site, remember to treat it with respect as it is sacred to the decedents of the original inhabitants. It’s also interesting to note that the entrances to most of the living spaces at Tuzigoot were located on the ceilings, rather than the sides, which allowed the inhabitants to maximize the amount of space within the city. The Visitor Center at Tuzigoot also has some great information regarding other former sites in the Verde Valley which used to be within the line-of-sight of the city, and good information about the excavation of Tuzigoot and the Sinagua people. If I was to tell you that out of all fifty states, Arizona has the most National Monuments; chances are you would not believe me. However, this is a fact, as Arizona has eighteen National Monuments, and the next closest state, New Mexico only has twelve. And, for bonus trivia points, the difference between a National Monument and a National Park is that the President of the United States can create a National Monument without Congressional approval and that a National Park must be enacted by Congress and signed into law by the President. Placing questions of law and land use aside, all of the National Monuments and State Parks present in Arizona mean that there’s plenty to do other than go to the Grand Canyon. One of the more interesting and little known National Monuments present in Arizona is Montezuma’s Castle. The Castle itself is one of two companion National Monuments in the Verde Valley/White Hills region of Arizona, the second being Tuzigoot National Monument (which I’ll discuss next week). Montezuma’s Castle is interesting because of what it is not. First, it is not a castle, it’s a cliff dwelling. Second, Montezuma never lived there. Third, it was inhabited by the Sinagua people – but around 1400 A.D., the site was abandoned by these people, and was uninhabited by the time it was re-discovered by settlers. Fifth, while it’s a great example of Native American cliff dwellings, it’s not even the largest example at the site – the “Castle A” remnants are ruins of a much larger structure. Now, I don’t know about you, but to me any one of these five points provides something interesting to speculate and ruminate on while you visit the site. Directions: Per the National Park Service, you’re going to want to take Interstate 17 to exit 289 (which is 90 minutes north of Phoenix, and 45 minutes south of Flagstaff). From Exit 289, drive East through two traffic circles (I know, bizarre, right? Another mystery – why two traffic circles in the middle of Arizona?) for a half mile (.5) to the blinking red light, where you will turn left and follow Montezuma Castle Road into the park. Once you enter the park, there is ample parking next to the visitor center. Once you have explored the visitor center to your heart’s content, there is a 1/3 (.33) of a mile interpretive trail that leads past the ruins of both Montezuma’s Castle and Castle A. The trail is flat, paved, and contains great views of the ruins and interpretive panels regarding the area. Tips: Unless you have a time machine, and can travel back to before 1951, you will not be allowed to enter the ruins of Montezuma’s Castle or Castle A (and yes, the National Park Service did allow people into the ruins until that point). However, the interpretive trail does provide some great views of the ruins. While you are on the interpretive trail, you will also be next to Beaver Creek (which no doubt provided water for the early inhabitants and their crops) which is one of the few year-round creeks in Arizona. If you’re itching to actually explore some ruins though, you’re stuck with two options: 1) become a Ninja and sneak in at night; or 2) visit Tuzigoot, which I’ll talk about next week! A couple of days ago, I was talking to a friend of mine, and she casually mentioned that the body of Guillermo Pino was found "in some caves somewhere in the desert". At the time, I didn't know what she was talking about - I hadn't heard of Guillermo Pino, and her description of the area -"some caves" was incredibly vague. I had some theories, however, and after a few questions I realized we were talking about the Arroyo Tapiado Mud Caves, an area I am fairly familar with, and an area I talked about earlier this year (http://lastadventurer.com/last-adventurers-fieldnotes/2012/1/3/the-arroyo-tapiado-mud-caves.html), and an area I was most recently in a year ago. When I got back home, I searched the internet and found out that Guillermo Pino did indeed go missing in the Arroyo Tapiado Mud Caves, and that his body was indeed found there recently. (http://cavingnews.com/20120507-body-of-missing-hiker-found-in-crevice-arroyo-tapiado-mud-caves, http://ramona.patch.com/articles/guillermo-pino-body-in-anza-borrego-cave-successfully-removed-identification-pending, http://blogs.laweekly.com/informer/2012/05/guillermo_pino_missing_anza-bo.php). Obviously, at a time like this, one first feels enormous sympathy for the deceased's family, and for the deceased himself - this is a tragedy for all of them, and a very sad day for the hiking community in general. The lesson to take from all of this, however, is to always recognize the risks attendent in outdoor activities, and to always be properly prepared for whatever adventure you are attempting. In this respect, its always a good idea to have someone with you, and if you don't have someone with you, have left a detailed plan of where you are going, when you will be back, and possibly to have some sort of portable beacon (GPS or otherwise, such as SPOT: http://www.findmespot.com/en/). The thing that stands out about Guillermo's death is my recollection of the Arroyo Tapiado last year. I remember my friend Jaime and I explored a number of caves; and that the caves closest to the "parking area" were somewhat busy with people (somewhat busy meaning that there was minimal foot traffic going in both directions). But as we delved deeper into the caves, into chambers and other areas off the beaten path, there were no other visitors. At that point, it could have been easy to get lost - and this was in conditions that were pretty much optimal (warm day, other cave visitors). The end result of this is that sadly, as mentioned above, a young man is dead. The other end result is that traffic to this area - the Arroyo Tapiado - will increase. While thats a macabre thing to say, it is also true. This is an area that has become more popular over the last five years as more people have become interested in outdoors activities, and now that it is in the news, the sensational aspect will no doubt attract more visitors ("hey, this is the cave that someone DIED in"). Disrespectful as it may be, this is how the world works. With this in mind, hopefully future visitors remember to take the necessary precautions needed for visits, and remember to be careful. Because, while the world is beautiful, as Guillermo noted, it is also dangerous, and the lesson we can take from his death - and honor his life - is to always be prepared when adventuring.